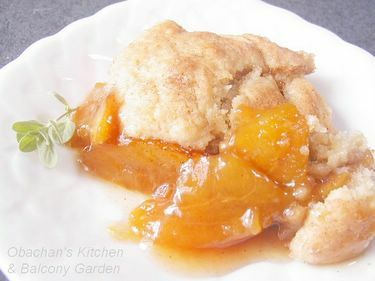 It has been my custom to make fresh peach cobbler at least once every summer since I came back to Kochi in 2000. Every time I tried a different recipe, and every time I thought “Well… not bad, but…” The problem was that I couldn’t find fresh yellow peaches and I didn’t want too-sweet canned stuff, so I always used white peaches. I love fresh white peaces so much, but when baked in a cobbler, I felt that something was not quite right. They didn’t go well with brown sugar as much as I had expected and I always preferred eating them raw. So this time I decided to use nectarines instead. Nectarines were on sale yesterday at the supermarket I always shop at. They were pitiful ones--- already turning brownish even though they were not quite ripe --- but I thought it wouldn’t matter too much when baked in a cobbler. I found this recipe on the net this afternoon and scaled it in half. I guess I didn’t make a mistake in calculation or conversion this time. I had to throw away some bad parts of the nectarines, but I had enough left for my half-sized cobbler. While it was in the oven, the wonderful smell of cinnamon and sugar filled my kitchen, and I realized that it was about a month ago when my kitchen was filled with the aroma from baking last time! It turned out pretty good. :D Using nectarines was definitely a right choice and I liked this recipe. Well, there’s actually a few things that I’d do differently next time: I’ll reduce the amount of brown sugar, add a bit more lemon juice and slice nectarines into thicker wedges so that I can enjoy their texture better. Also, I might use milk instead of hot water for the crust. But I’m glad I found this recipe. For some reason, I like “crust-on-top” peach cobbler recipes better than “peach-on-top” ones. Too bad that the nearby supermarket ran out of vanilla ice cream today!! Next time, I’ll make a bit less sweet version of this nectarine cobbler and, when I eat it, put a big scoop of ice cream on top while the cobbler is still warm… Hmmmmmmm!!!. 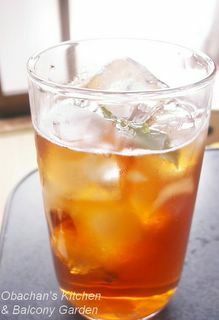 For now I’m enjoying it with cool, crisp iced tea. 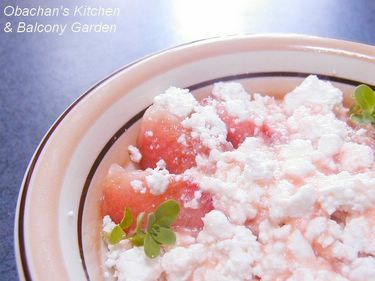 When I posted about my ruby red grapefruit & cottage cheese salad, carlyn gave me an idea, in her comment, of making the same kind of salad with peach. So I tried it out for my brunch this morning. My mom called me up last night and said she would bring me some home-made tokoroten today when she comes to Kochi city for a tea ceremony meeting. 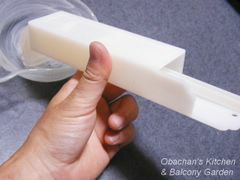 I met her in front of a train station this afternoon to receive a tiny cooler box with tokoroten and bunch of ice cubes and coolants stuffed inside. So what the heck is tokoroten anyway? 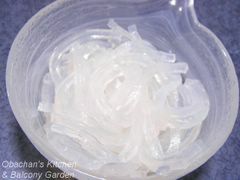 OK, it’s jelly-like noodles… or should I say noodle-like jelly, or maybe, agar noodles? To make home-made tokoroten, you first need to get dried tengusa, a type of seaweed. 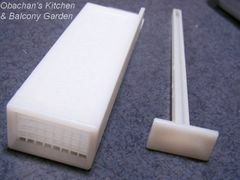 (Of course it's easier to use dried kanten-bars or kanten powders. 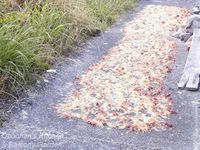 They are dried form of gelatin from the seaweed.) Well, my mom really made the tokoroten from scratch this time; she picked tengusa seaweed every time she went to the beach this summer, dried it and kept it somewhere in the house for about a month. She really loves doing things like that, but I do hope she stored the dried tengusa somewhere far away from kitchen this summer …because it really STINKS!! 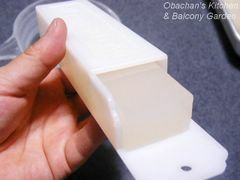 To make tokoroten from scratch, you soak dried tengusa in water first, and then boil it in water to which a little vinegar added. 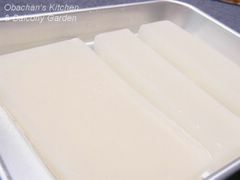 When the water thickens with the gelatin from the seaweed, strain it to remove the seaweed and pour the glue-like soup into a vat and refrigerate. I read somewhere that leaving it at room temperature to let it settle makes better-tasting tokoroten, but I don’t know if it’s true or not. This is the tokoroten I got from mom today. Now I'll show you how to make these tokoroten chunks into noodles. To do that, you need a special devise. As you can probably figure out from the way this devise looks, the process is pretty straightforward. and push it with the bar with a flat top. 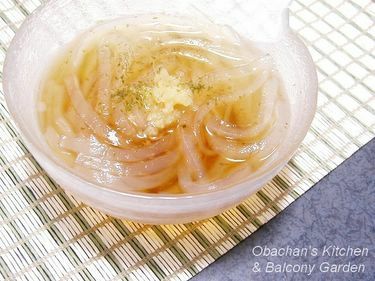 You can eat tokoroten noodles with either sweet sauce or soy-vinegar sauce. I like soy-vinegar version better, with a bit of grated ginger and aonori ( green laver) maybe? 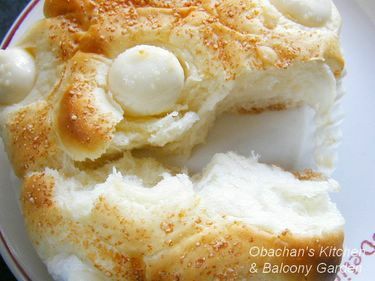 This summer, tokoroten became suddenly popular throughout Japan and almost all the stores ran out of this summer food at one point. The reason was (I think) a TV show that introduces healthy foods and health tips every week. 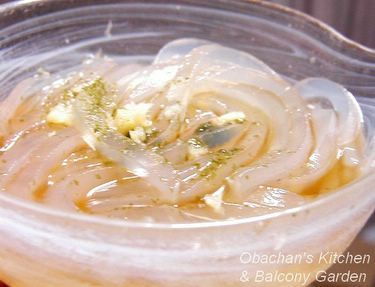 A few months ago, it featured tokoroten as a zero-calorie diet food which also reduces blood sugar, cholesterol, body fat and blood pressure, and raises basal metabolism. People rushed to the stores right after. To be perfectly honest, I don’t take what this TV show introduces at face value any more since the spring before. They said that eating yogurt and mackerel and drinking sweet Chinese tea would prevent cedar allergy (or reduce its symptoms), and I had them almost every day for good two months or so. And I ended up having real bad allergy symptoms that spring. So I don’t really expect to be super-healthy tomorrow morning, but it doesn't ruin my pleasure of enjoying the interesting texture of the noodles. Inspired by rae’s recent post, I started making infused vodka about 2 weeks ago. This is what my grape-infused vodka looks like at this point. I poked the grapes with a toothpick to let the purple color come out from the skin. Right now the drink looks rather light pink than purple, but it’s getting sweeter and I do notice the fragrance of grape when I take a sip. Maybe it’d be really good and flavorful in another 2 weeks. This bread looked so cute on the shelf at my favorite bakery. 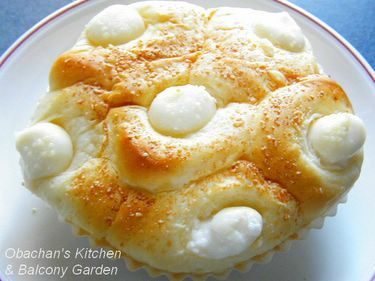 This was a sweet bread with condensed milk kneaded into the dough and lumps of sweetened cream cheese on top. Oh, and grated cheese (maybe parmigiana?) was sprinkled on top, too. Really yummy! Yes, dear readers, I survived!! Unfortunately, there’s not many food-related topics regarding this festival. Our team supplied us with bentos for lunch and supper for 2 days, but they were nothing special, and I couldn’t take pics of them anyway because I didn’t bring my digital camera with me. As I wrote in my post about the festival linked above, we danced outdoors in parking lots, shopping streets, shopping arcades and main streets. We “paraded” as we danced, and when we reached the end of each dance venue, we could get drinks at a small booth called “kyusuijo (water booth? ).” There local volunteers poured iced tea or water in plastic cups for dancers and collected empty cups. (Only a few booths offered sports drinks perhaps because those are much more expensive than plain water and tea.) Now, each dance team consisted of 30 to 150 dancers, and at one venue, about 70 or 80 dance teams performed a day… I guess. Imagine how much work volunteers had to do to save us from dehydration… I thank them from the bottom of my heart. They are literally our lifesavers!! Also each dance team had a “drink-supply car” which met the team at the end of the performance at each venue and supplied drinks. So these are what I remember having at the festival this year. 2) Iced Japanese tea or woo long tea (Back left in a big plastic cup) --- the 2nd most popular drink at the booths. 3) Iced water with a bit of lemon slice (Back right in a big plastic cup) --- One booth offered this drink and we liked the refreshing lemon flavor. 4) Lemoria (Paper pack on the left. The drink is in the small glass right next to the pack)--- Lemon-flavored soft drink with herb extract mixed. Supplied at the drink-supply car of our team and probably donated by the former sponsor of our dance team. 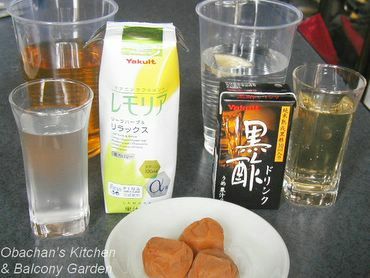 5) Kurozu (Dark vinegar) drink (Paper pack on the right. The content is in the small glass.) --- Same as above. Most (esp. middle-aged) dancers incl. myself rushed to the drink-supply car for this drink. 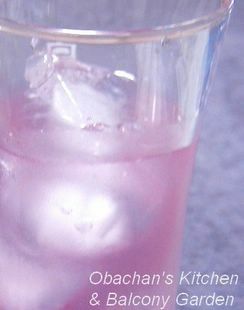 The vinegar and ume-plum juice mixed in this drink were a good source of citric acid. 6) Umeboshi (Japanese plum pickles) --- These are not drinks, but supplied at a few booths. Great source of citric acid. Other than these drinks, some dancers brought a little amount of salt wrapped in plastic wrap and licked it when taking a break. I sneaked out and bought this because I was really running out of energy way before our supper time. 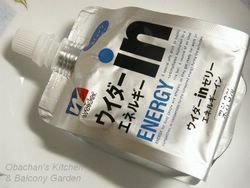 This is "a special jelly drink to supply carbohydrates equivalent to a rice ball," according to the text on the package. I like this because it doesn’t cause stomachache even if I dance right after consuming it. You might think that instead of all those preparations and considerations about dancers’ conditions, we could just have this festival when the weather is cooler, and that would save a lot of money spent on the huge amount of drinks and make things easier and safer for the dancers, staff and audience. Well, tell you the truth; we are stupid and crazy. And being stupid and crazy is exactly the heart of this dance festival. Last night I was invited to a wonderful BBQ party at my friend’s friend’s house. It was my very first BBQ this year and I’m so glad that I did have BBQ at least once this summer. Guess how many blueberries I was able to pick from my balcony garden this summer? 3.5. No, not thirty-five. Three point five. And the “point five” was the real tiny berry which was about half a size of a regular one. What can I make out of the 3 and 1/2 blueberries? I couldn’t think of anything but using them for garnishing. So this is what I did. 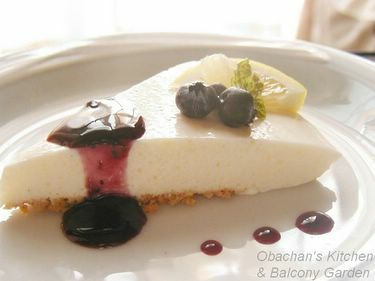 I made a gelatin cheesecake and garnished it with a small slice of lemon, mint leaf and fresh blueberries from my balcony garden! The gelatin cheesecake was just so-so, and the graham-cracker crust at the bottom fell off while transferring the cake to this plate. But, dear readers, to my biggest surprise, the fresh blueberries tasted WONDERFUL, even the half-size one, too!!! Since the blueberries I bought at the Sunday Market a while back tasted pretty tart, I expected mine to be the same, too. After all, the hot and humid climate here in Kochi cannot be so great for blueberries, and I didn’t do anything special to my blueberry plant… except watering it every day. So, I didn't expect much. 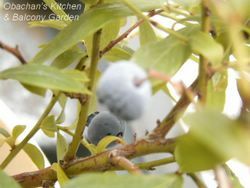 My blueberries, however, tasted so sweet and flavorful, not like those I bought at the market at all !! Oh how wonderful it would be if I could pick more of such good tasting blueberries next year?! You might think I'm overreacting, but for me, fresh blueberries always meant something expensive, being imported from abroad. And probably because they were picked before completely ripe, they were usually a little tart. These days locally grown blueberries are available, but as I wrote above, they are still expensive and not very tasty. Being able to pick such expensive, foreign berries from my own balcony garden, when they are completely ripe and tasty, is almost like a dream come true for me. Oh I can hardly wait. Don’t you feel like jumping right into this bowl and swim with these shiratama dumplings? This dessert was an idea I found in a women’s magazine the other day. The pic looked so terribly attractive that I had to give it a try myself. The syrup was a mixture of mint liqueur, sugar and water. Buying mint liqueur for the syrup was not a problem. I found it at the liquor store where I bought the marsala wine the other day. The problem was the filling for the dumplings. The original recipe called for candied (or sugared?) lotus seeds, but I had no idea where I could find them. The ones I found on the net were so expensive. So for half of the dumplings, I used shiroan (sweet white bean paste) for substitution. The rest was left with no filling. 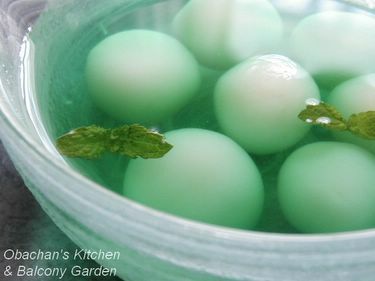 1) Shiroan filling does not go with mint liqueur syrup. It makes the minty syrup taste like TOOTHPASTE. 2) Plain dumplings taste better in the syrup than shiroan version, but rather tasteless. What could be a tasty filling for this dessert? What could go well with shiratama AND mint liqueur? Any ideas?